Thunder Over Cedar Creek Lake is a spectacular Airshow that will entertain and enthrall you with aerial vintage aircraft, new technology, dog fighting simulations, fly by’s, acrobatics and an up-close-and personal experience with the power of our military jet fighter. You’ll see an amazing array of both civilian and military aircraft. The Airshow performance takes place entirely over the water; where you can watch the action and listen to the flight controllers from your boat! You can watch the action packed evening not only from your boat on the lake but also from various areas around the Lake as well as the VIP seating available for $60 per person on the Pinnacle Club shoreline. The Thunder Over Cedar Creek Lake Airshow will honor past and present military personnel and proceeds will benefit not only the personnel but also the families of our selfless military vetereans by assisting with the funds needed by all of the benefiting charities. 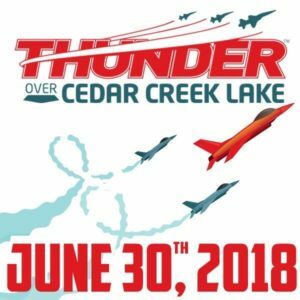 Thunder Over Cedar Creek Lake was established as the primary fundraiser for the Cedar Creek Veterans Foundation(CCVF). Our mission is to honor the courageous men and women who have served to protect our American Freedoms and to be of direct benefit to the survivors of those Warriors by providing financial support for those agencies responsible for their care and nurture. The families of those individuals who have served are the core to the normalization of our injured and rehabilitating Warriors into the civilian setting. When you purchase VIP Tickets or provide a Sponsorship for the Air Show, you are enabling us to help more wounded military personnel and veterans, including their families. Your donations help the Cedar Creek Veterans Foundation assist with the physical and emotional recovery and rehabilitation of wounded, injured and disabled military personnel and veterans, with a focus on those individuals residing in and organizations serving the Northeast Texas region. We have been able to support in a financially beneficial manner three organizations shown below; please assist us to continue to do so for the future! Thunder Over Cedar Creek Air Show FREE viewing from boat, lake shores, and from private property. Listen to the Air Show as KCKL, 95.9 FM, will be broadcasting live again this year! Limited VIP tickets to sit water side to view the Air Show are available via charitable donation of $50 to the Cedar Creek Veterans Foundation. VIP seating located on the private shores of Pinnacle Golf & Boat Club. Tickets required to enter Pinnacle Golf & Boat Club, unless resident or guest of resident. Food and beverages sold at Pinnacle Golf and Boat Club. NO COOLERS ALLOWED. Go South past downtown & follow signs to Hwy. 30. Get on 30 and follow to Martin Luther King Blvd./Hwy 175 exit. Stay in Left lane and follow onto 175 East. Go South to the Kaufman, Hwy 175 exit and follow onto 175 East. Go 19.3 Miles to a “Y” on the highway. Take the Right arm towards Athens. Follow 21.3 miles, past the sign that says Mabank Business to the next sign, “Mabank, Gun Barrel City, Highway 198” sign and take exit. Go South 8.4 miles on 198 thru Mabank & Gun Barrel City to a “T” on the highway. Turn right & continue on Hwy 198 toward Payne Springs. Follow 1.0 miles until you come to a large storage building on the Right side. “Payne Springs Storage” and turn Right onto County Road 2531. It is 3.5 miles to the Pinnacle Club entrance. You will go thru a 4-way stop and take the Right turn at the “T”. Pass the stone entrance for Pinnacle and continue on to the front gate. The gate will take your tickets. Follow the parking directions given at the gate and have a wonderful time! Please remember that no vehicles are to park to block emergency equipment nor on private property in the Pinnacle Club area. Take Hwy 31 from Tyler to Malakoff. At the red light in Malakoff ( Hwy 198) turn right. There is an Exxon/McDonalds on the corner. Go 5 miles on Hwy 198 through Caney City and over 2 Cedar Creek bridges. After the second bridge, there will be a sign for CR 2830. Across the street from Lake View Deli. Take a left at CR 2830. Drive 1.5 miles on CR 2830 to a 4-way stop at CR 2531. Turn left on CR 2531. Drive approximately 1 mile following signs leading to Pinnacle Club. At the entrance to Pinnacle, veer slightly right- past the stone entry. Once at the Pinnacle Club security gate and after checking in with the Security Guard, signs will direct you to parking. Take Hwy 31 going east towards Athens. At the red light in Malakoff (Hwy 198) turn left. There is an Exxon/Mc Donalds on the corner. Drive approximately 1 mile following signs leading to Pinnacle Club. At the entrance to Pinnacle, veer slightly right -past the stone entry. Once at the Pinnacle Club security gate and after checking in with the Security Guard, signs will direct you to parking. Please note that if you had pre-paid for your tickets to the VIP Area, they can be picked up at the security gate by talking with one of the CCVF members at that location on Air Show day!